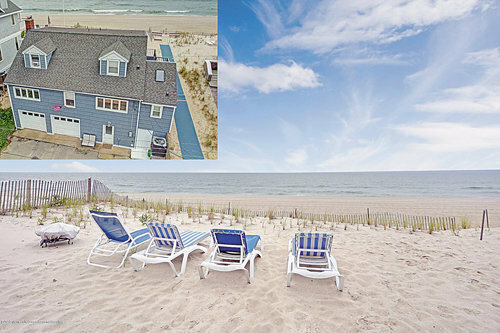 Cape, Single Family,Detached - Mantoloking, NJ Great opportunity for a second home to enjoy endless summers at the beach or primary home to enjoy the oceanfront lifestyle year round! This charming cape style home is located on 50x125 lot situated at the end of the private Bel Air Beach Association consisting of 16 homes. A sunlit open floor plan on the main living level boasts two bedrooms, a full bath & breathtaking views. Updated kitchen with cherry cabinets, granite counter tops and stainless-steel appliances flows into the dining area and living room with wood burning fireplace surrounded by stone. Upstairs has four bedrooms and a full bathroom. Additional ground level garage/rec area with a full bath. Ample Parking. Home was NOT substantially damaged in Sandy. Current flood insurance is approximately $804 per year.